Smallest fangs are 1" x 1 1/4"; largest fangs are 1" x 3"
How exciting is it to pick out pumpkins for jack-o-lanterns? You can see potential in the shape. Sometimes they are tall and dramatic. Sometimes they are adorable and plump. Their personality just shines through the bright orange flesh. Maybe you carve the same design year after year. Maybe you think far ahead of time for a unique expression each year. Or maybe you're even training in a new jack-o-lantern designer this year and helping the next generation catch on the Halloween enthusiasm. 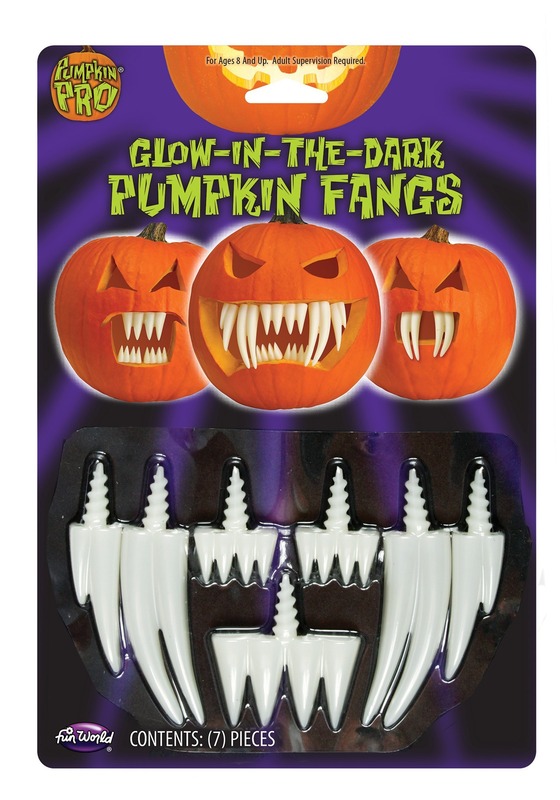 Here's the thing, creating truly dramatic jack-o-lantern teeth can be tricky and if you want to take your pumpkin to the next level, you'll want these glow-in-the-dark chompers in your arsenal. You'll get seven fangs with this set. From the two dramatic three-inch fangs to the vicious little one-and-a-half inch teeth, you'll be able to put together all sorts of looks by simply twisting the screws into the open pumpkin mouth. It's easy enough for kids to do to make your seasonal pumpkin carving extra special. It's always fun to create something frightening with the kiddos! Your child will find wild ways to use these glow-in-the-dark teeth, year after year. So carve out a generous mouth and some angry eyes and who knows, your jack-o-lanterns just might be the most spooky on this Halloween season. Maybe they'll even scare off those neighborhood kids with Halloween tricks in mind! Bout time those pumpkins scared back!